Vintage Side Table w/shelf and drawer - Painted w/Cottage White Chalk Paint, sanded in the right places, hand waxed & buffed for a clean Chic Shab appeal. SOLD!! 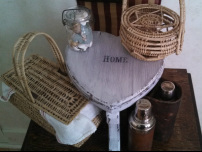 Rejuvenated Heart Shaped Foot Stool/Riser - Painted with Gray Chalk Paint, Dry brushed in Cottage White, and Sanded for a Cottage Chic Shab Look - then hand stenciled w/"HOME". . as home is where the heart is. 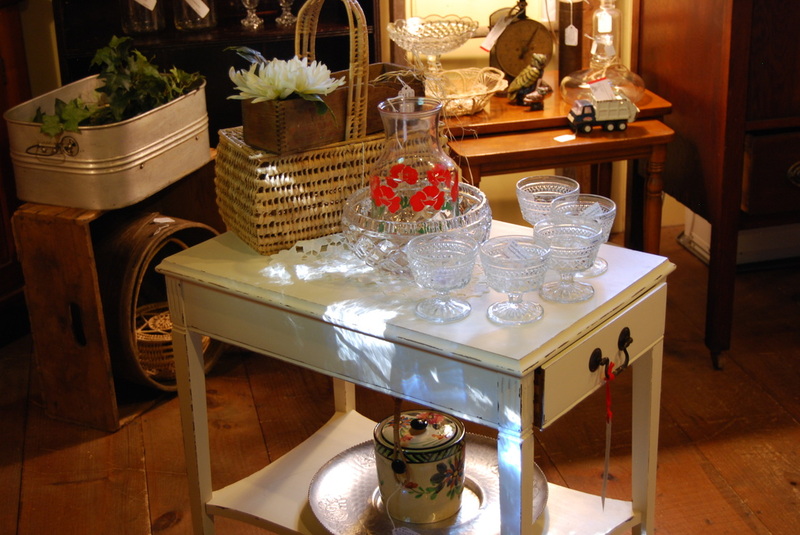 . .
Each item can be seen at Four Corners Brick House. If interested in a particular item, contact me. If you have QUESTIONS or COMMENTS, please feel free to contact Oomph Redesigns. Rejuvenated Lamp: Base painted black and sanded in just the right places for that current day PB Look w/added new Burlap Drum Shade. Black Beauty FOUND a new home! SOLD!